One of the problems of living in post-modern America is that one is expected to ACT like a Christian, but THINK like a Pagan. That is, go to work for almost any retail business and you will be told you should not steal from the company. But don’t dare say, “Thou shalt not steal”. The company has to waste a lot of time and energy establishing a code of ethical conduct for employees that is easily surpassed by the Biblical code of morality. And the thing about it is, the management knows this. When they’re hiring they’re looking at that potential employee and asking questions about their beliefs–but they can’t say any of that out loud! Why? Because Christianity has been marginalized as being “politically incorrect”. Utter nonsense. The First Amendment is in the Bill of Rights and begins with a statement about the right to freely practice religion. Yet this idea has been twisted around by the notion that it’s only “tolerant” to keep one’s mouth shut and one’s religion to one’s self. Okay, a week or so back I blogged about X-Men, Fantastic Four, and the present situation with Marvel film properties at studios other than Disney/Marvel. I can’t claim to be on the inside on any of this stuff, but I have had the opportunity to do some sample pages in hopes of getting work at Marvel. That is, a few years back I managed to get the okay to send samples from one of their new talent editors. Then a year or so of sending samples and they sent me some partial scripts to do samples using their characters. The previous post and this post have pages from those samples I did. I am of the opinion that I “choked” on this assignment. Not unlike The Chicago Cubs do whenever they get to the World Series. I’m still a Cubbies man, and Marvel still speaks to me–but let’s face it, if they’d thought these pages were amazing I would have been cashing Marvel checks by now. As it is, they still respond to my submissions and say encouraging things–some day I’ll get there. But I promised to talk about Wolverine. 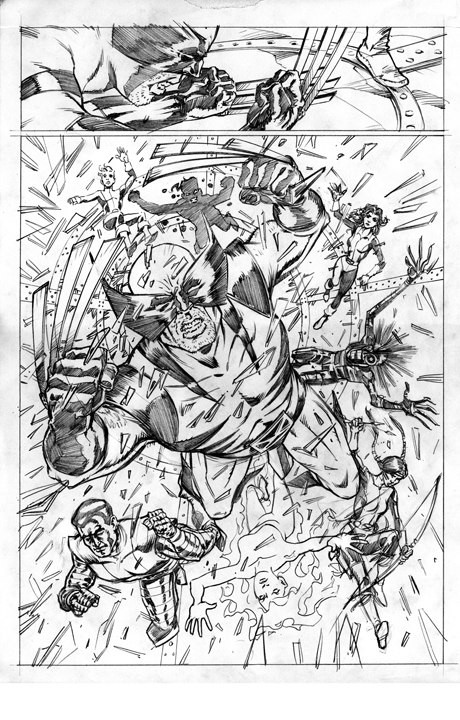 You may recall in my previous post there was a comment about how Wolverine seems to appear in nearly every X-Men story. That may have sounded kind of snarky–wasn’t meant to be. But I did notice that when Marvel sent me the sample scripts that every one of them DID include Wolverine. That was about the time I really started noticing that he seems to get around, at least in X-Men titles. For a brief period in the 1960s Batman got a lot of guest spots as well, due to the popularity of the Adam West TV series. So for a while Batman was front and center on Justice League of America (though Superman was usually there too). This quickly died out and Batman was left to his own titles, though he was the regular star of The Brave and The Bold along with others of the DC stable. In the 1980s things got a little more even when Superman was given the leadership of Justice League and Batman took the helm of The Outsiders. Soon after the success of The Dark Knight Returns Batman became DC’s go-to cover boy. The landscape at Marvel seems to have shifted as well in recent years. Sure Spider-Man is still popular, but the X-Men kind of took over beginning in the 1980s. And now Wolverine is top choice for cover model. So what if he seems to be in every X-Title? In Tokyo at one moment and London the next! Sure, why not? It’s not unusual at all to see this sort of thing in a comic book, or a line of comic books. Did anyone gripe about how many covers Richie Rich was on at Harvey? Nope. Just more of the same. If you’ve got a hot character you use him (or her) to promote your other books. So that’s my opinion. Use Wolverine to sell the titles until people get tired of seeing him. If we judge this based on the previous examples of Superman at DC and Spider-Man at Marvel–we’ve probably got about 20 more years to go with Wolverine. So we might as well get used to it. And when Wolverine has had his day, maybe Howard the Duck will be back in vogue–or on the cover of Vogue!